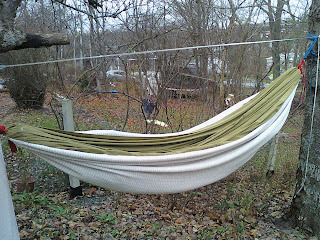 I wanted to experiment with this large weave fabric that I found, to see how it would hold up as a hammock. I used a very wide nylon trim (75cm, or half of the full width) to make the whole thing 3m wide. Last night I was in this with a sleeping bag and was warm most of the night, the temperature got down to -7c according to the thermometer a few meters from the hammock. I can not yet dress warm enough to sleep below zero without a sleeping bag in a thin hammock. The trim covering the top of the hammock when I am inside is a nice bonus feature. 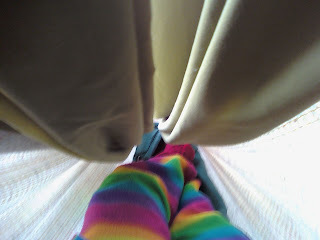 The fabric stretches a little when I get in, making getting out an interesting challenge, I need to basically climb out of the hammock, I can't use the rolling out method that I usually use.